- Extra thick .45 mm acid-free PET plastic, an average of 10-25% thicker than most other protectors on the market. Thicker plastic = Better protection for your collectibles! - Easy-peel protective film that keeps the PopShield from getting scratched before it gets to you. 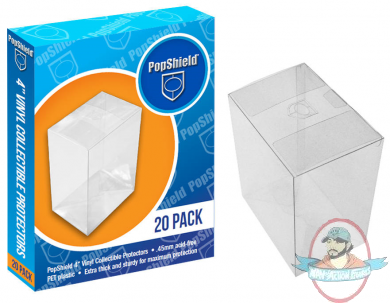 - Push-lock tab that adds structural integrity to the box when formed, and keeps your 4-inch vinyl collectibles inside no matter what happens. - PopShield logo is stamped on the top flap for brand recognition!